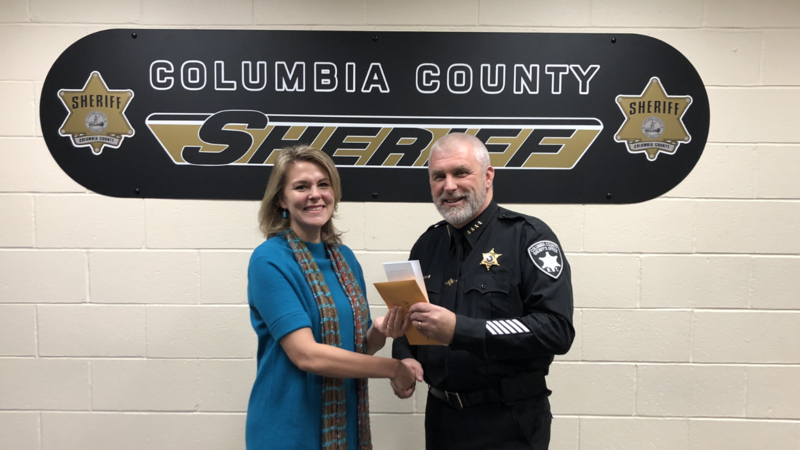 Claire Parde, the Executive Director of the Healthcare Consortium, is pleased to announce the receipt of a donation of over $7,000 from the Columbia County Sheriff’s Office! This generous donation will bolster the agency’s Columbia County Community Cancer Fund, which is used to provide financial assistance to residents of Columbia County who have a diagnosis of cancer. The funds were raised through the “No-Shave November” Initiative, in which participants stopped shaving in order to raise awareness and funds for cancer. The goal of No-Shave November is to grow awareness by embracing hair, which many cancer patients lose through the course of treatment. Staff who chose to participate each made a donation, symbolic of the money typically spent on shaving and grooming. 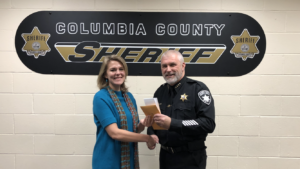 Sheriff’s Office command staff, law enforcement and corrections personnel, and part-time Deputies all took part, and the Columbia County Deputy Sheriff’s Benevolent Association union matched their members’ donations. In total, a remarkable $7,270.00 was raised and donated to the Columbia County Community Cancer Fund. “I’m proud of our staff for embracing the initiative and volunteering to help raise funds for this important cause,” said Sheriff Bartlett. “Unfortunately, most everyone has been affected by cancer in one way or another. It’s nice to be able to do something to assist those directly impacted by the disease,” the Sheriff added. The Columbia County Community Cancer Fund is managed by the Healthcare Consortium, which dedicates every dollar raised directly to Columbia County residents with cancer. Monies from the Fund are used to pay for health-related expenses like health insurance premiums, co-pays, and deductibles, as well as living expenses like rent, utilities and fuel oil, which may become hardships when the costs of fighting the disease absorb all of a person’s resources. No matter how it is used, the help is always critically important and very gratefully received. For more information about the Columbia County Community Cancer Fund, please call the Healthcare Consortium at (518) 822-8820 or visit its website at http://www.columbiahealthnet.org/programs/financial, where an application for financial assistance from the Cancer Fund may be found. Donations to the Cancer Fund can also be made on-line at this address.